The black and grey ombre Hero Arts ink pad did not appeal to me at first, but then I thought about Halloween and then it went on sale at Ben Franklin Crafts so it seemed like a 'sign' that I should get it. LOL! 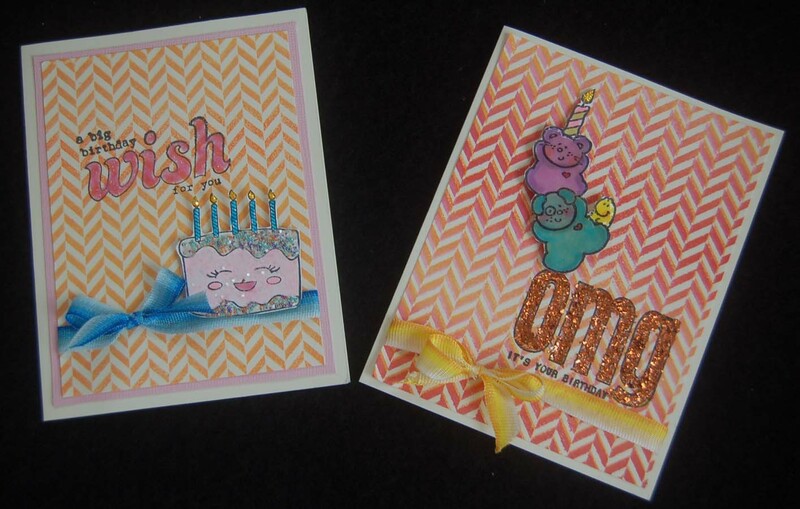 I made this card to showcase what can be done with the Ombre ink pad and the Hero Arts Kelly cling stamp background. The weird zombie brain jar stamp (came on a sheet of unmounted images) is from Viva Las Vegas Stamps where you can find a huge assortment of unique Halloween themed stamps. 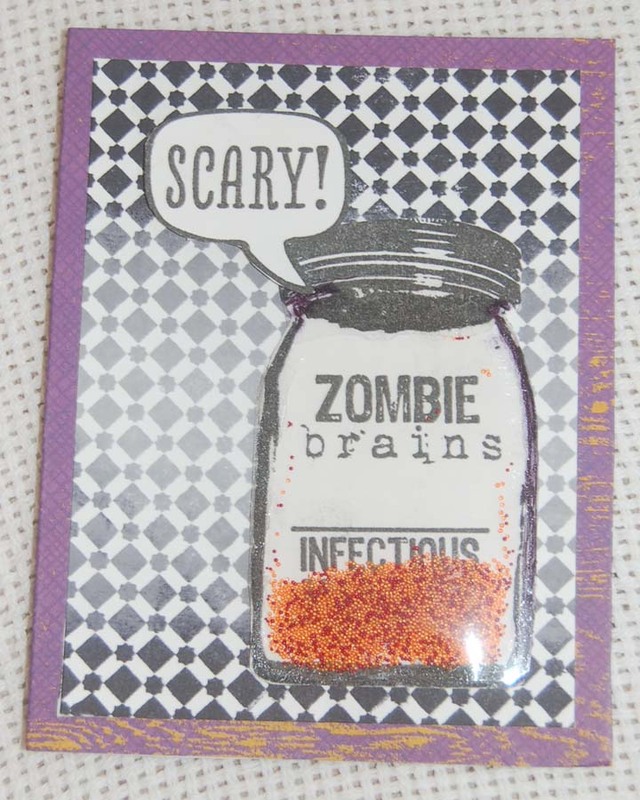 I think my son will enjoy the humor of this card because he works in a medical lab that deals with projects involving brain disorders. The shaker jar was made simply by cutting an acetate sheet the same shape as the stamped image and gluing the edges with Beacon 3 in 1 glue. I left the top of the acetate (the jar neck) open and filled the pocket with Martha Stewart micro beads before gluing the the neck closed. Does it look like the brains are talking? Have a spooky Halloween! 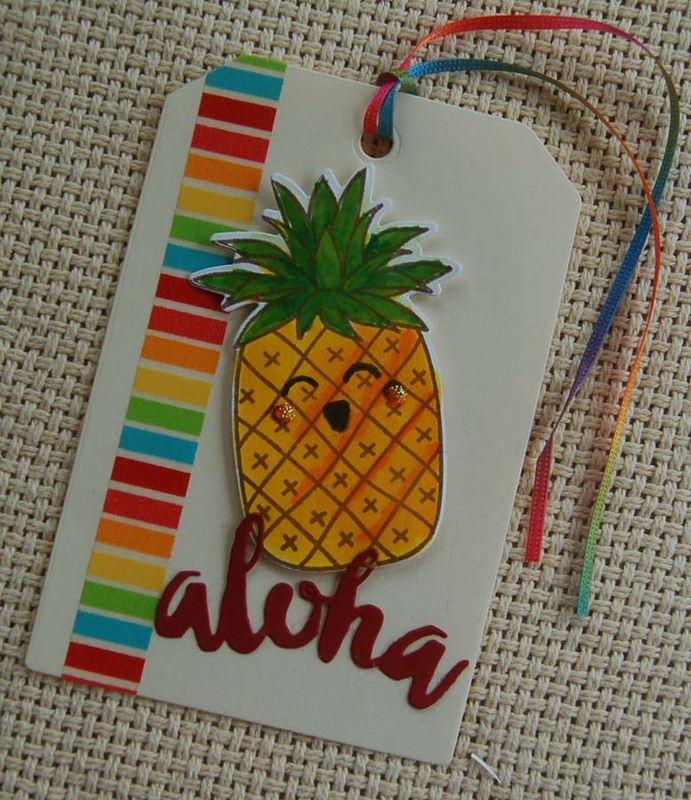 I couldn't wait to try out my new set of Kuretake/Zig brush markers so I grabbed other items I just purchased at HM Ben Franklin Crafts and decided to make a quick tag. Since the pineapples in my yard are plentiful and sweet, I was inspired to make a simple tag with the new Avery Elle pineapple stamp and matching die set. I really was anxious to get my hands on that 'aloha' die....hope they make a mahalo one too. The markers worked like a dream...gliding on smooth and blending easily. I love the marker brush tips because they are tiny but very flexible so coloring is super easy. I also just purchased some Doodlebug rainbow colored washi tape for another project, but I needed more color on my tag so 'zip,' on went the washi tape. The finishing touch was a skinny rainbow Heiko ribbon that I purchased awhile ago at either BFC or Celebrations. Oh, I added a face to the pineapple with a Kitty Bee stamp and some Stickles. The base for the tag was cut with a Little B die from a set. Okay, playtime is over for now....time to put away my toys. See you soon! These boxes were my take on those famous words uttered by the witch in the Wizard of Oz. Remember how she ended up squished by the house? I used a Lawn Fawn die to cut the mini milk carton boxes and decorated the house-like shapes with witch hats and feet (felt stickers from Ben Franklin Crafts...cover the sticky side with black card stock). The sentiment on the hand-cut banner is from a CC Designs unmounted rubber stamp set purchased at BFC. The boxes open from the top or bottom. I stapled the tops closed and plan to use the Heiko Halloween stickers (BFC) to seal the bottoms after filling the boxes. These are simple treat boxes that only look like they were time consuming to create. 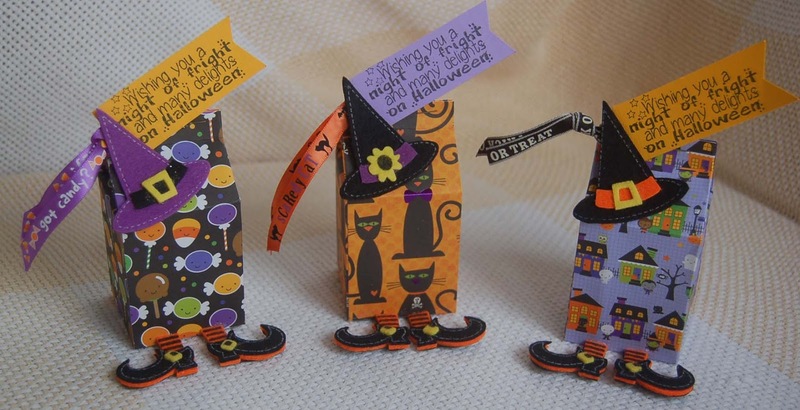 Hope you'll get started on making something special for your trick-o-treaters. You're sure to get some big jack-o-lantern smiles! I think this ombre ink background is the most successful one I've made so far. 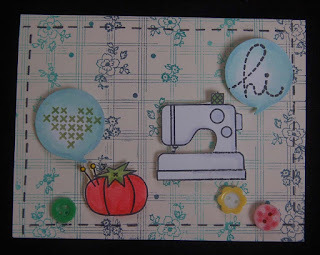 Perhaps it's the vintage-look fabric background stamp (Hero Arts) that helps to showcase the variation in blues. 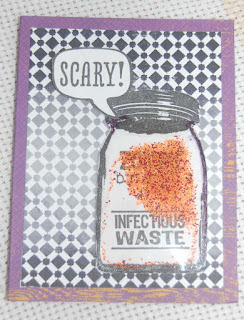 Anyway, I thought the Paper Smooches images would fit well with the stamped background...I stamped the back of the card, too. My wacky sense of humor made me give voices to the sewing machine and pin cushion. The PS speech bubble dies made this easy to do. 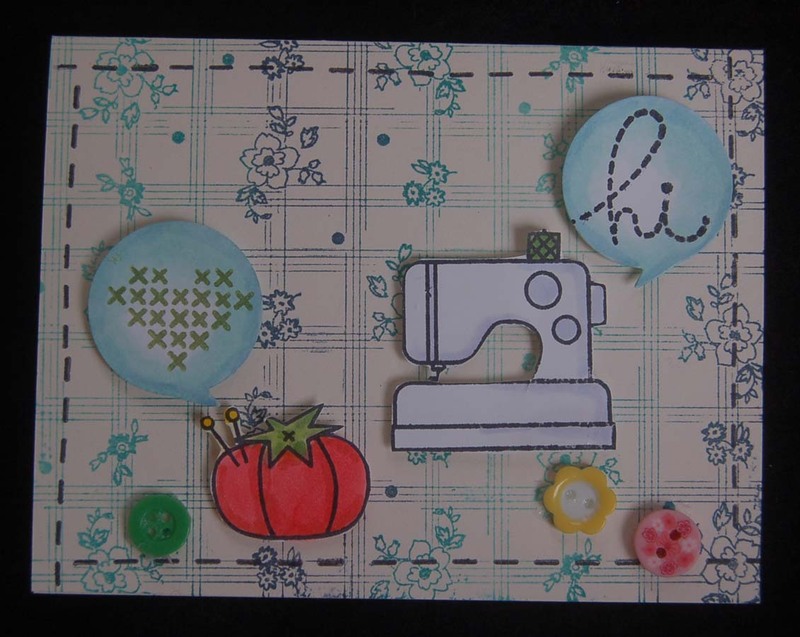 I think the border of stamped stitching and glued on 'real' buttons adds to the overall look of the card. This card is a perfect addition to my stash of cards for any occasion. Thanks for stopping by and I hope that you've been inspired to check out the 'ombre' supplies at HM Ben Franklin Crafts. If you think that this looks store bought......you're right! I bought a package of these cards at HM Ben Franklin Crafts. I loved the look of them and intended to add embellishments to give them a 'handmade' look.,,,still might glue on some flowers or crystals. However, when I saw my Avery Elle 'tea time' stamp set on my desk, I knew I wanted to add some teacups and the sentiment. 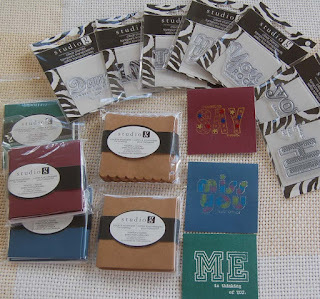 I used gold ink and embossing powder to heat emboss the words. The clear stamp set has two different tea cups and a saucer. 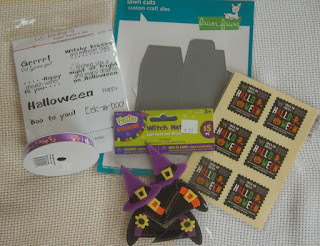 It was easy to paper piece them with pretty print paper from the Studio G packs I purchased at BFC...only $1.50 a pack! The hardest part of of doing the teacups was cutting out the handles. If a handle looked bad after cutting I just cut it off and glued on another one. Reinforcing the back of the handles with clear Beacon 3 in 1 glue is a good idea. 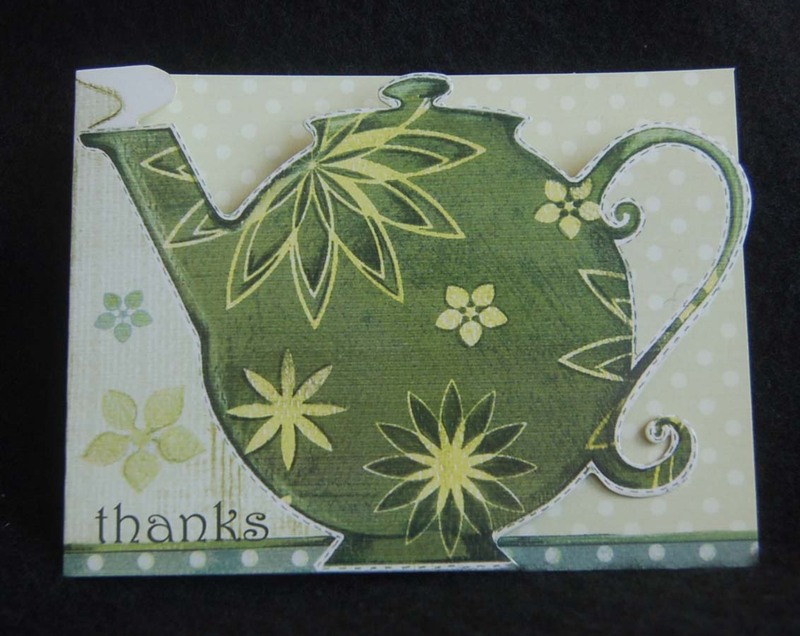 If you want to add a handmade touch to your thank you cards, you don't always need to do a whole card. 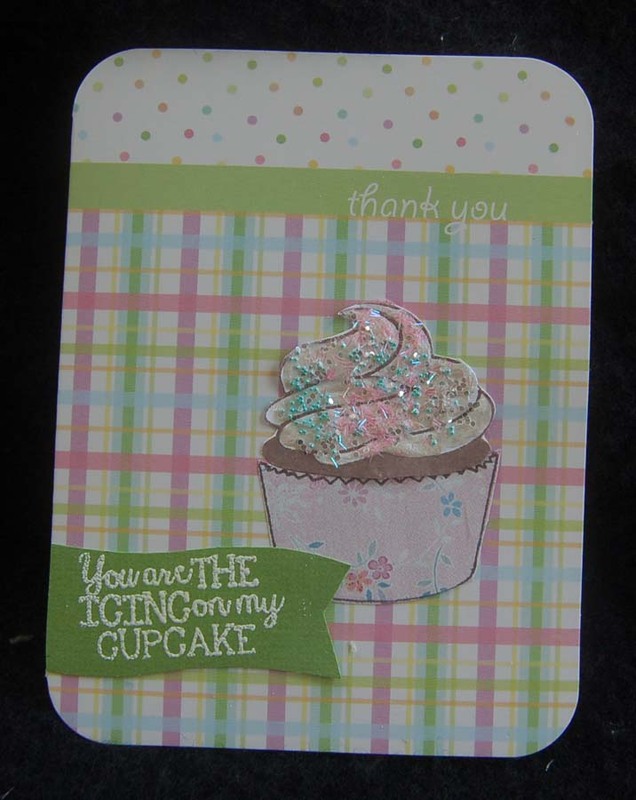 A little effort on the inside of this store bought card satisfied my need to create and personalize my 'thank you'. There are lots of gorgeous blank cards in Ben Franklin Crafts and they are very economical. Have some crafting fun today! Here is another thank you card that I made using a pre-made blank card as a base. This pretty card comes in a package of 20 cards with envelopes. 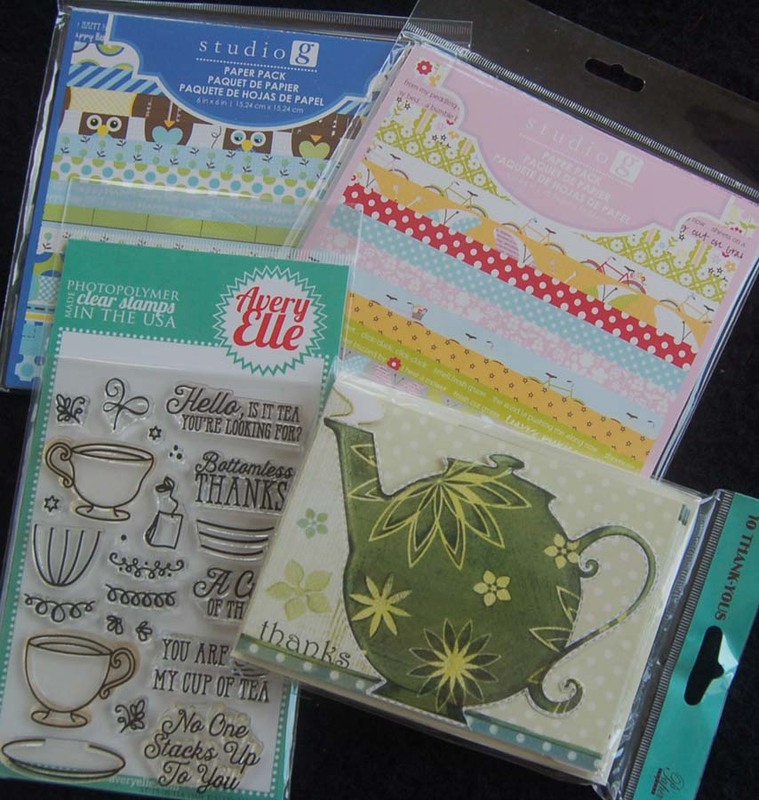 You can find many attractive blank card packs like this at HM Ben Franklin Crafts. 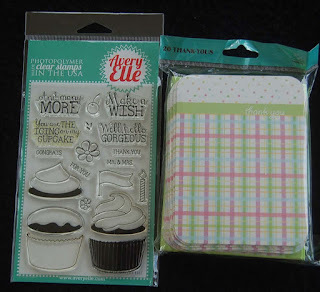 It is simple work to 'cook up' cupcake cards with the use of Avery Elle's cupcake clear stamp set. I paper pieced the cupcake liner and frosted the cupcake with Bo Bunny pearlescent paint in tubes which are sold at BFC and come in many pastel colors. Before the paint dried I sprinkled on glitter and tiny beads. Stamping the cupcake top with dark brown ink will make it look more realistic. A bamboo skewer is a good tool for pushing the 'frosting' in the swirl pattern. I stamped the words on a hand-cut banner with white ink and heat embossed it with white opaque detail powder. 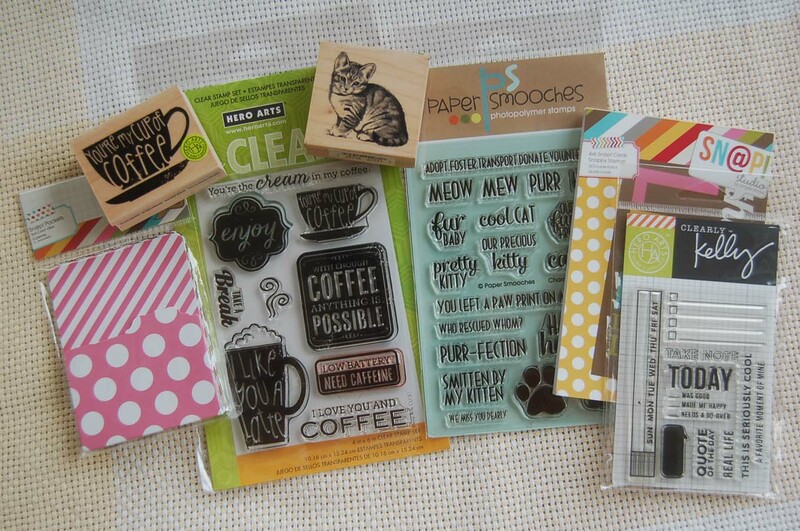 I purchase both the stamp set and card pack from HM Ben Franklin Crafts because I know they will be useful for many future cards. Enjoy a creative life! As soon as I got my hands on a few of the Hero Arts Ombre ink pads, I set to play...er, work. 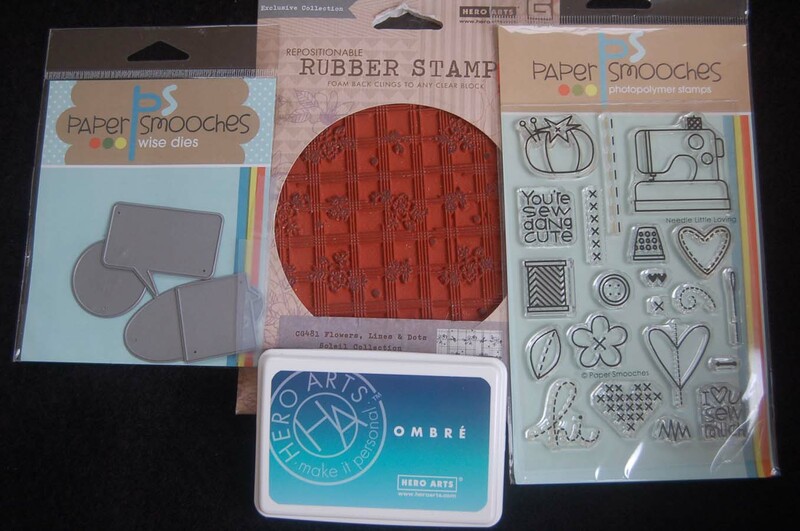 After stamping around a bit, I decided I needed to visit the Hero Arts online site to learn some techniques. I realized I wasn't using the ink pads in the way they were intended. 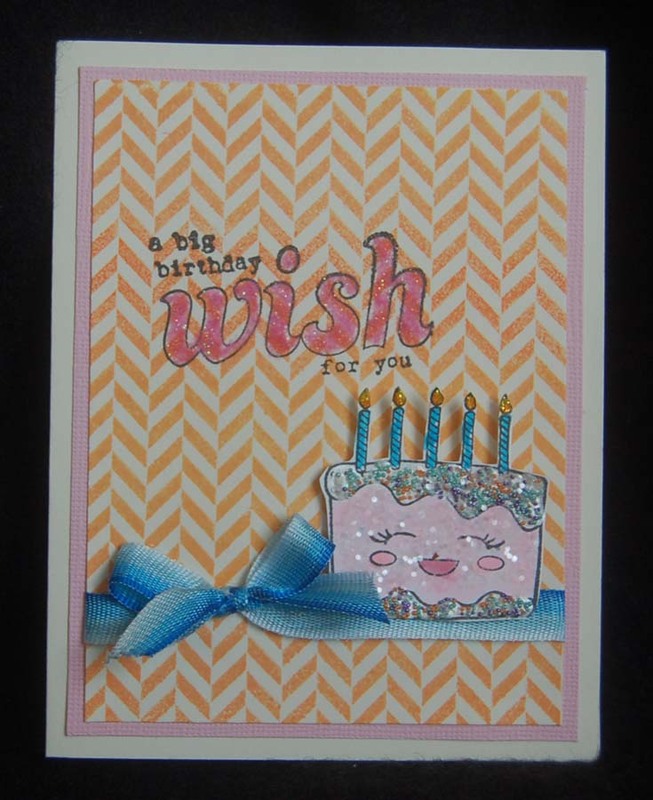 I still was not able to get a great ombre look with the yellow orange using the chevron background (Hero Arts) stamp (cake card). However, the pink pad yielded a very nice effect so I stamped it over one of the yellow ombre tests and it really pleased me (OMG card). Not wanting to waste ( Mom always said,"Waste not, want not".) 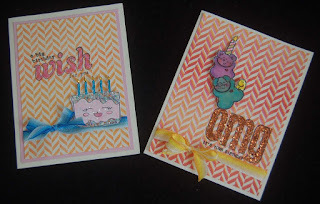 the non-ombre yellow chevron pattern, I stamped it with bargain (only $1.50! 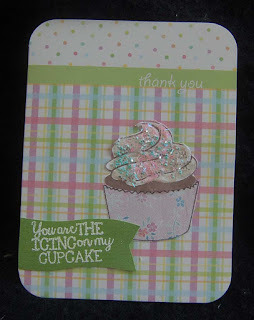 at BFC) Studio G stamps and added pink Martha Stewart glittered flocking and MS glitter and small no hole beads. 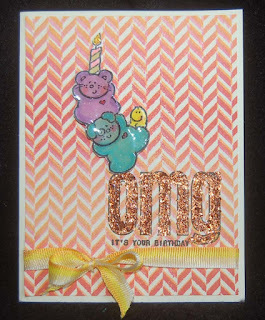 The ombre ribbon (Heiko from Celebrations) seemed just right for this card. This ribbon is soft enough to tie an easy bow but firm enough not to be droopy. For this card I applied Crystal Accents over the Taj image and MS vintage leaf glitter from a set on the OMG. I think I 'need' to get more colors of the ombre ribbon...*wink*wink! Oh, I saw other colors of ombre ink pads and background stamps at HM Ben Franklin Crafts....they seem to be calling my name....LOL! I think my adult son does not like all the childish cards I usually give him. (He'll always be my baby. *wink*wink*) With this in mind, I decided to make a sort of office (he works in one) themed card. I started with a 6x6 card blank made from a Canvas Corp 12x12 sheet. To this I adhered a Snap studio 4x6 card from a pack. (It looked like an index card with the 'oh happy day!' banner.) 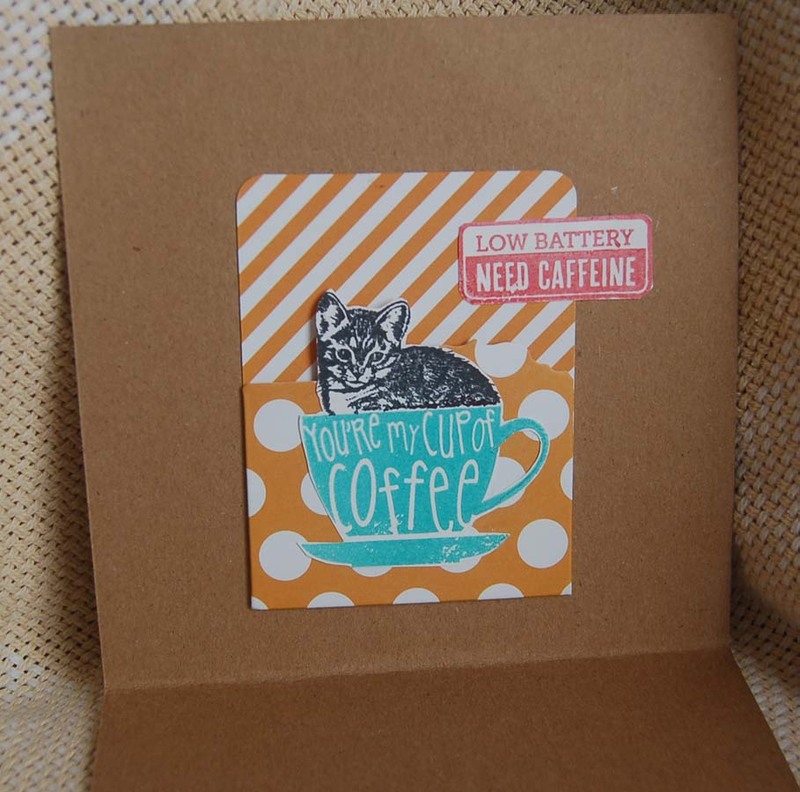 I added some stamped words from the Hero Arts 'Need Caffeine' stamp set, Clearly Kelly (HA) set, and Paper Smooches ' Charmed Cat 2' stamp set. 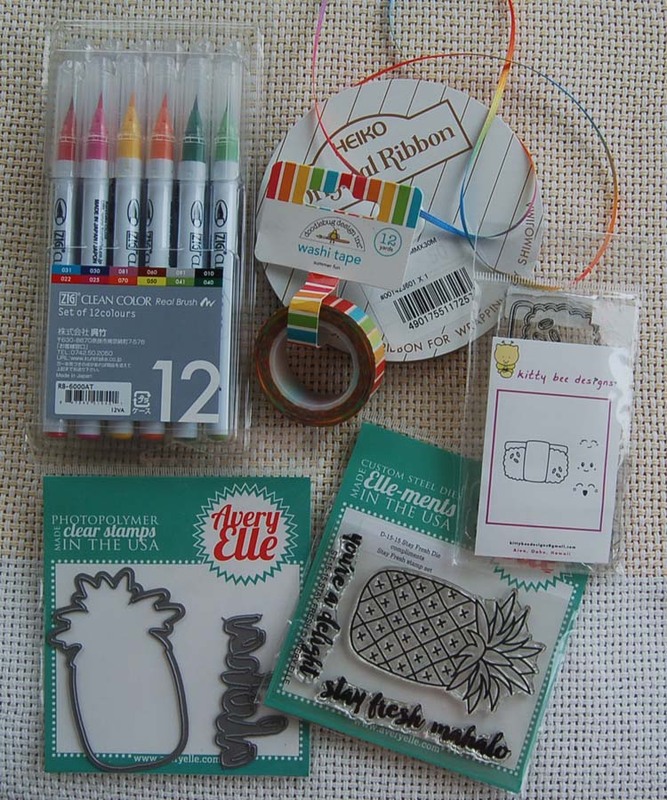 Even though I didn't need any more Snap studio items for my albums, some of the employees at the Hilo Ben Franklin Crafts store said that the clearance (Snap studio) items could be used for card making. I agreed and found that they are excellent because of the colors and small size. Since I was going to give a Starbuck's gift card, the Snap studio pocket seemed just right. I happened to have the wooden handled HA cup stamp into which the Inkadikado cat image fit perfectly. Masking the stamped cup allowed me to stamp the kitten into the cup. 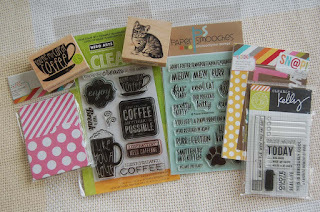 The HA clear stamp set has a smaller image of the cup which you could use with a smaller animal image. Oh, the paw prints on the front of the card were added to cover an ink smudge, but ironically it helped to connect the outside to the inside of the card. Don't you just love it when you can turn lemons into lemonade. Sweet! Back to school time made me think of all the little notes I used to tuck into my kid's lunches and backpacks. 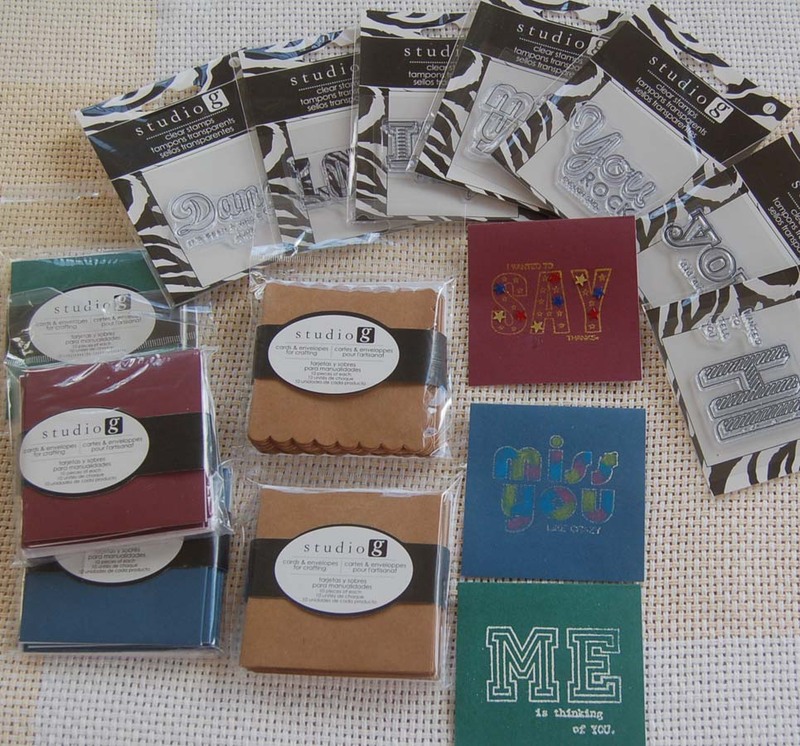 When I saw the packs of Studio G note cards with envelopes and the trendy word stamps (that fit perfectly on the cards) plus the acrylic blocks to mount the clear cling stamps, I thought I'd share the great deal with all of you loving parents. 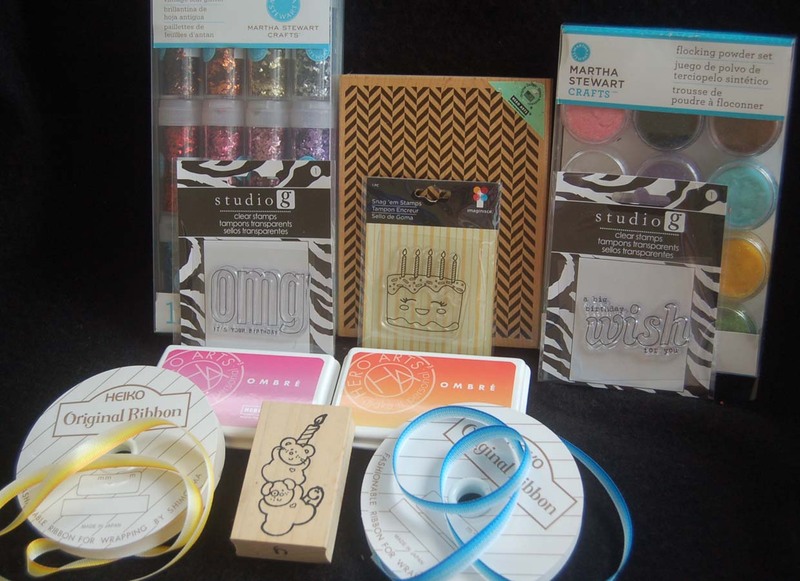 At HM Ben Franklin Crafts there are lots of these Studio G products (including some ribbons, brads and tapes) for a mere $1.50 or 4 for $5!!!!! I just had to squeeze in this back to school bargain before they run out. 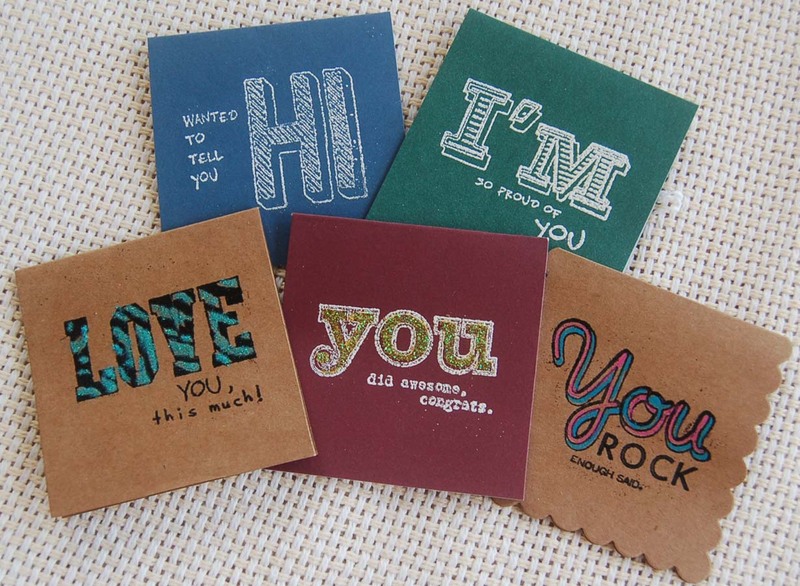 Love notes will make your kids smile inside for years!